Effort, sweat, and dedication seem to have become the profanity of western Christianity. 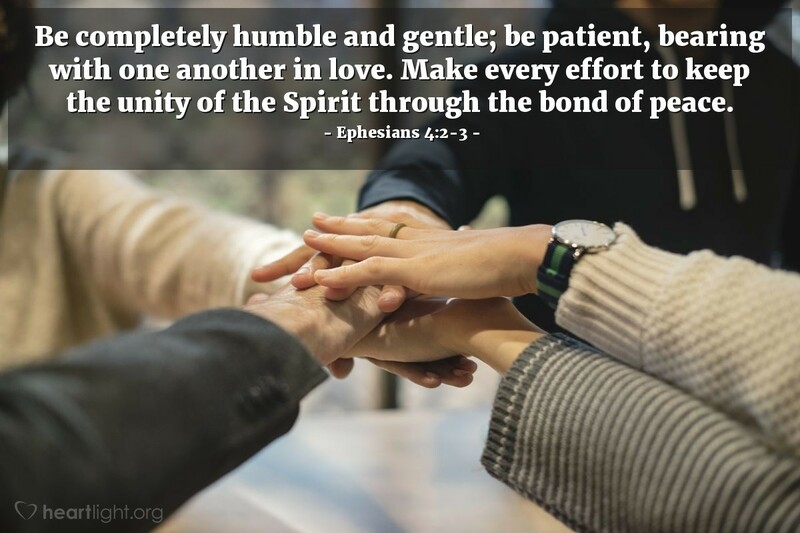 To our age of grace-abusers, the Holy Spirit reaches out with his truth and reminds us that relationships on earth, even those in Jesus' Church, are going to require a lot of effort, gritty love, personal sacrifice, and rigorous determination. If we read Jesus' prayer for unity in John 17, how could we not make every effort to keep his Body unified and our relationship with his people loving and patient? Since our salvation was purchased at the cost of Jesus' sweat and blood, how can we balk when our best efforts are required to preserve the unity of his family? Dear Heavenly Father, forgive my impatience with others and lack of forgiveness for them. Stir your Spirit within me to curb my tongue, soften my heart, and extend more of an effort to others who need your blessing. Please use me to be a peacemaker in your Kingdom, O Lord. In Jesus' name I pray. Amen.